St. Augustine, America’s “Oldest City” is a quaint historic community with a storybook quality, off busy interstates and away from the flash of a theme park atmosphere. Located in the northeast corner of Florida in a landscape of moss-draped live oaks, sabal palms, palmetto, marsh grass, sand dunes and miles of beaches, it brims with interesting and fun things to see and do. In a young country like America, where old is a relative term, the city of St. Augustine is really old and has sites to prove it. Founded by the Spanish in 1565 as a defense bastion during their New World exploration, it offered protection to the armadas as they traveled the Gulf Stream transporting riches from Central and South America. It pre-dates the landing of the Pilgrims in 1620 and even the 1607 Jamestown settlement and, much to the fascination of visitors, elements of the Spanish period remain to experience. Location is the reason the area was so desirable to the Spanish and to the indigenous Timucuan Indians before them. Location is why it was fought over and controlled off and on by both the Spanish and the British from the late 1600s through the 1700s, and was finally acquired by a fledgling America in 1821. Location is why railroad magnate Henry Morrison Flagler built it into a winter resort for the wealthy during the gilded age of the late 19th century. It is also the reason visitors flock there today. St. Augustine offers a wonderful combination of past and present, old and new. A walk through the historic Ancient City peels away the cultural layers of the past. For history buffs of all ages, a remarkable collection of historic landmarks chronicles the passage of time, beginning in the 16th century, and offers unequalled immersion experiences. 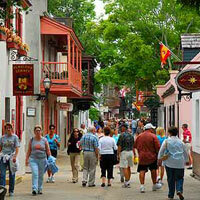 As such, St. Augustine is a must see destination for young people and adults alike. Walk down narrow cobblestone streets lined with diminutive buildings of coquina stone and wood. Peer through the walls of the Castillo de San Marcos, the oldest masonry fort in continental North America and imagine how the Spanish guarded their settlement. Discover the oldest wooden building in the United States, a schoolhouse dating to the early 1700s, and learn about life in the remote outpost in the Colonial Spanish Quarter. Among these relics from the Spanish period, find examples of the rugged yet simple life of the Florida Crackers, hardy American pioneers who homesteaded the newly acquired territory beginning in the early to mid 1800s. In contrast, marvel at the lavish excess of America’s industrial wealth of the late 1800s at one of the greatest architectural specimens in the Southeast, the heavily ornamented Spanish Renaissance Flagler College, at one time the Hotel Ponce de Leon. The gilded Rotunda with ornate carvings and the Dining Hall dappled in the glow of 79 Tiffany stained glass windows are astounding. While strolling from one fascinating venue to another, hunt through antiques shops, browse through art galleries, find the perfect curio along St. George Street or something special in trendy boutiques. Enjoy the culinary pleasure of diversely tasty food served in casual bayside or oceanfront restaurants, in curbside bistros, Spanish tavernas, sleek contemporary dining venues, or opulent dining rooms. There is more than history in St. Augustine. For water, sun, and beach lovers, expanses of sandy beaches to the north and south offer swimming, surfing, shelling or a wonderful spot to just lie in the sun with a good book. For naturalists, there are tidal salt marshes and nature preserves to explore. A golfer’s dream, great golf courses are scattered throughout the area, including Sawgrass, host of the PGA Players Championship, the Ponce de Leon Golf course, the oldest in Florida, or the World Golf Village. 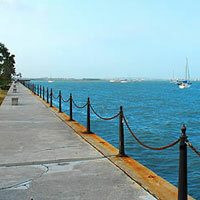 St. Augustine’s location also gives it ideal year-round weather. With its hottest days in July rising to 88°, and its coolest temperature in January an average of 45°, it is a more moderate in climate than tropical south Florida, yet its winter days are kept mild by the warming influence of the Gulf Stream flowing off shore. There are three seasons in St. Augustine: spring, summer and fall. Winter - sunny, dry, and mild - is a delightful blend of summer and fall. Rain clouds predictably gather in spring and fall, but thunderstorms generally last only a short time. This pleasantly mild year-round temperature lends itself to outdoor events and activities throughout the year. In the spring, enjoy arts and craft festivals and the Gamble Roger Folk Festival, one of the best in the country. With summer comes Summer Concerts in the Plaza, theater at the Limelight, or concerts and great food on St. Augustine Beach Pier. As September folds into fall, the diverse cultural heritage of St. Augustine - Spanish, Greek, Colonial, and Cracker- is celebrated through festivals, re-enactments and events. After Thanksgiving, the Ancient City lights up for Christmas during the Night of Lights celebration, best viewed from Christmas trolleys or horse-drawn carriages. Of course, water sports, tennis, golf, deep sea, fresh water or pier fishing, and hiking in the many parks can be enjoyed any time. The population the city of St. Augustine proper is over 12,000. However, neighboring communities flow one into the other which, taken together, create a population of over 25,000. St. John’s County, of which St. Augustine is a part, also includes beach communities to the north and to the south, and ranch and farm land to the west, has a population of just over 161,000. Selected by AAA in 2006 as one of the 10 most walkable cities in North America, historic St. Augustine is compact, covering approximately 8.4 square miles. Without lingering, the historic district can be walked from one end to the other in 20 minutes. Transportation: St. Augustine is primarily accessible by car. Its delightful accommodation choices make it the perfect weekend get-away. It is also a pleasant day trip from Orlando, located just under two hours to the east, a nice change from the largess of theme park venues. Once in St. Augustine, the Downtown Parking Facility, next to the Visitors Information Center on Castillo Drive and convenient to sites in the historic district, has 1,170 spaces, each $7.00 per day. Parking is free at Old Town St. Augustine on San Marco Avenue with the purchase of a trolley tour on Old Town Trolley Tours of St. Augustine. With a wide selection of 5,663 rooms from which to choose in St. John’s County, the choices of accommodations are many. Enjoy a romantic stay at one of 26 intimate historic inns, all with descriptive names; experience the elegance at the Casa Monica Hotel, meticulously restored to its 1888 Flagler-era splendor; relax in the simplicity of the leisure life of 1960 America in the low-scaled motels in unpretentious beach towns. For those desiring contemporary accommodations, St. Augustine of the 21st century is showcased at nearby world class golf resorts and in full service luxury beachfront resorts. 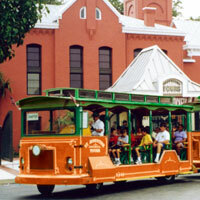 See the Best First on Old Town Trolley Tours® of St. Augustine. 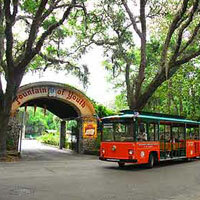 The first thing to do in St. Augustine is take a fun and informative narrated tour of the Ancient City aboard the Old Town Trolley. You’ll catch all the important sights and get to know the city from a local’s perspective. It will also help you decide how to spend your time for the rest of your stay. On tour you can hop on and off at any of the 20 convenient stops to explore the area. As an extra bonus, you can ride FREE on the hourly shuttle service to Anastasia Island, stopping at the Alligator Farm, St. Augustine Lighthouse and St. Augustine Beach. Climb through Castillo de San Marco, St. Augustine’s signature historic site, and the oldest masonry fort in continental North America. Stroll down St. George Street, the quaint pedestrian-only walking plaza. Shop for unique souvenirs and art in at the myriad of shops housed in diminutive stone Spanish period buildings, with overhanging wooden balconies added during the British period. Get a bird’s eye view from St. Augustine Lighthouse for a panoramic view of the Ancient City, the surrounding bay and marshes, and the Atlantic Ocean and beaches from the top of the black and white striped 161’ tower. 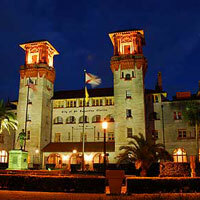 Tour the jewel of St. Augustine, Flagler College. You’ll be awed by its grandeur explained with great pride by well-informed students. Spend a day in the “land of crocodiles,” the St. Augustine Alligator Farm Zoological Park. Relatively small in size and privately owned, kids of all ages will enjoy one of the best attractions in Florida. There is far more to see than 23 species of crocodiles. All variety of Florida wading birds fly in to roost every evening in the native swamp exhibit, and it is also home to exotic birds and mammals from all over the world. Be there at 3:00 pm on Saturdays as massive, 15-foot Maximo emerges from the water to devour his meal! Believe It or Not! at Ripley’s, the permanent home of founder Robert Ripley’s personal collection is the first of Ripley’s “Odditoriums, appropriately housed in “The Castle,” a Moorish Revival mansion built in 1887. Experience haunted St. Augustine. Layers of history have created one of the most haunted cities in America. Discover why on the Ghosts & Gravestones of St. Augustine trolley tour along which you will stop to visit three of the most haunted houses in the city. 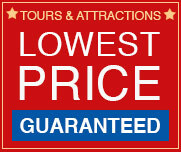 Or, walk through the really ghostly areas of town on the Ancient City Tours Walking Ghost Tour. Visit the Ximenz-Fatio House. Of the three dozen colonial era buildings remaining in St. Augustine, this circa 1798 coquina stone house on quaint Aviles Street is one of the finest. Explore “Antique Alley”. On San Marco Avenue, just a couple of blocks south of the Old Jail , explore an avenue of wonderful antique shops, used books, galleries, home interior shops, cafes and more. See St. Augustine by Sea. Get out on the water and enjoy a different perspective of St. Augustine’s landmarks aboard the Victory III, whose legacy stems from one of the area’s first Minorcan settlers, or the Schooner Freedom, a replica of a 19th century blockade runner, both departing daily from St. Augustine’s Municipal Marina. For the thrill of offshore fishing or the intrigue of backwater fishing through the salt marshes, lagoons and rivers, charters depart from several marinas including the Conch House Marina and Camachee Cove Yacht Harbor. on Anastasia Island in a setting that includes beaches, salt marshes and Florida hammock, walk along nature trails, kayak through marsh, swim on the beach, fish, and birdwatch. A 2600 acre coastal reserve located off A1A in South Ponte Vedra Beach with both incredible natural and cultural resources is open daily for exploration. Fresh and saltwater marshes, tidal creeks and estuaries teem with sea life and over 230 species of birds. Extensive shell middens from pre-historic times are a testament to the longevity of this plentiful habitat. Find real solitude15 miles south of the city on US1 in 1609 acres of wild landscape with nature trails and a creek for fishing or canoeing. Try St Augustine’s hot little secret, the spicy heat of the datil pepper, brought to the area by the immigrant Minorcans in 1777. Mostly backyard-grown, it flavors foods in local restaurants, and bottles of the spicy condiment are found on restaurant tables throughout the area. The Ancient City. With the look and feel of an ancient European village, the charming, walkable 144 square block area of historic St. Augustine, so full of historic sites, museums, historic inns, countless restaurants, great art and shops and boutiques galore, offers a fascinating journey back in time. The Beaches. Only minutes away from the historic immersion lies all that is synonymous with Florida: miles of white sand beaches; small oceanside villages; newer waterfront developments; parks with tidal marshes and old Florida live oak hammocks; nature trails to explore, on foot or by boat; glorious sunsets; waterside restaurants serving fresh seafood; and swimming, shelling and golfing to enjoy. Just across Mantazas Bay over the Bridge of Lions, Anastasia Island is a combination of residential neighborhoods, a protected bird sanctuary amid sand dunes and salt marshes, and beautiful beaches. 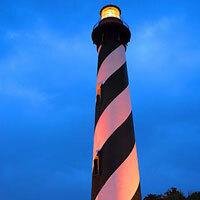 You can climb the St. Augustine Lighthouse, visit the Alligator Farm Zoological Park and hike through the sea marsh habitat of the Anastasia State Park and Recreation Area. 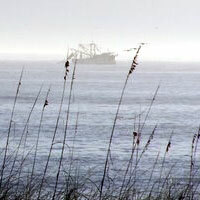 Miles of beautiful beaches beckon as does the laid-back beach town of St. Augustine Beach. Oceanside restaurants, an active night life, beach front lodging, golf, and fishing off St. Augustine Beach Fishing Pier are all nearby. Just further south on beach highway A1A, encounter the small 1960s era Crescent Beach community tucked in a serene natural setting. A delightful combination of cottages, large waterfront homes and condos are within walking distance of a scenic beach fringed by sea oat covered sand dunes. Minutes north of St. Augustine, over the Usina Bridge and somewhat overshadowed by the notoriety of St. Augustine Beach, is Vilano Beach, known for its lovely beach and great surf fishing. Primarily a year-round residential community tucked between the Atlantic Ocean and the Tolomato River, it has several small 1950s motels, larger recently built hotels, and restaurants, all within walking distance of its beautiful beach. Continuing north on A1A, sample seafood restaurants in the serene seaside atmosphere of North Beach, or venture up the beach about 20 minutes north to upscale Ponte Vedra Beach where the focus is golf, but where tennis and horseback riding on the beach are popular too. The seaside town, thoughtfully planned as far back as the early 1920s, has an understated charm, despite the addition of million dollar homes, large, luxurious, amenity-rich resorts and spas, wonderful restaurants, scenic golf courses, and elegant boutiques. Best known for its prestigious golf courses, including Sawgrass Stadium, home of the famous Island Green, selected as one of the “World’s Most Photographed Holes,” it is home to the PGA Tour and to the Association of Tennis Professionals. Aviles Street. Venture just south of central town plaza at the end of St. George Street, right off King Street, to the brick paved Aviles Street, the oldest street America and part of the original 1572 town plan of St. Augustine, where you’ll find wonderful little shops, bistros, galleries and museums. Fort Mantanzas. 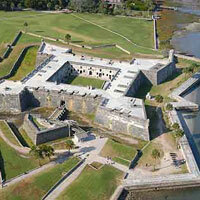 Drive 14 miles south of St. Augustine down A1A to the “little” Spanish fort, Fort Matanzas. The National Park Service offers guided tours daily after a short ferry ride to this island bastion, built by the Spanish in 1740 to guard the Mantanzas Inlet, the rear access to their settlement. Bird watching. You don’t have to be a serious birdwatcher to enjoy wood storks, roseate spoonbills, ibis, herons of all colors, egrets, great and snowy, and plenty of pelicans. Just bring your camera. Laced with beaches, inlets, rivers, tidal lagoons, waterways and salt marshes, the area is resplendent with at least 260 varieties of shore birds, wading birds and migratory birds and you can see them just about anywhere: on a stroll down the beach, dining at a waterfront restaurant, at the Alligator Farm and Zoological Park, or in any one of the three state parks. Washington Oakes State Park, about 20 miles south of St. Augustine on A1A has wonderful gardens to walk through on the west side, good fishing off the Intracoastal Waterway and great coquina formations on the beach. Sharks teeth at Vilano Beach. Bring your patience and sharp eyes and walk the beach a little north of the jetty at Vilano Beach and you just might find handfuls! Nalus’ Fish Tacos. On your visit to Anastasia State Park be sure to stop for great fish tacos and other Baja fare this little food vending trailer near the entrance to the park. Fusion Point. The sushi is great, as are the American/Oriental fusion entrees, at this little spot north of the Old Jail on San Marco Avenue. Sunshine Shop is the place to find hundreds of swimsuits. Look for it on St. Augustine Beach at 645 A1A Beach Boulevard. Simple Gestures. Next to Gypsy Cab Co on Anastasia Boulevard, this eclectic gift shop is full of “artsy” items. Smoked Salmon from Kyle’s Seafood Market. When you’re driving about, stop in at Kyle’s just north of St. Augustine on US1, for a chunk of great smoked salmon, smoked out back everyday! Don’t forget the Captains Wafers to go with it. The Spice Rack. Stop in the little shop on Hypolita Street where spices and herbs from all over the world are blended into interesting flavor combinations. Claude’s Chocolates. Also on Hypolita Street, indulge in the most wonderful handmade chocolates, as beautiful as they are delicious, and made by Claude himself. There are all kinds of interesting and fun things to do in St. Augustine - for FREE! First Friday Art Walk: You don’t have to be an art aficionado to enjoy art galleries open from 5-9 pm throughout downtown St. Augustine on the first Friday of every month. See the work of local, regional and national artists, hear live bands, and enjoy wine, cheese and other refreshments. Take a free trolley ride from gallery to gallery provided by Old Town Trolley Tours®. Uptownsay Night: Stoll down “Antique Alley” (San Marco Avenue) until 9 pm on the last Saturday of each month and browse through antique shops and galleries. The atmosphere is congenial and there is plenty of entertainment and other activities. St. Photios Greek Shrine: At 41 St. George Street, the first national shrine of the Greek Orthodox Church remembers the first colony of Greeks to arrive in St. Augustine. Old City Farmers Market: Local produce, baked goods, arts and crafts and more await your selection every Saturday morning at the St. Augustine Amphitheatre on A1A South. Memorial Presbyterian Church: From 9am-4pm, Monday thru Saturday, tour this spectacular copper-domed church, a replica of St. Mark’s Cathedral in Venice built by Henry Flagler in 1889 in memory of his daughter Jenny Louise, on the corner of Valencia and Sevilla. If you’re lucky your visit might coincide with one of the organ concerts held throughout the year played on the magnificent 5000 pipe organ. St. John’s Flea Market: Find a real bargain or a piece of memorabilia at one of the 500 booths at the I-95 interchange at Rt. 207 every Saturday and Sunday. Summer Concerts: Thursday evenings, from Memorial Day - Labor Day, enjoy free concerts on the Plaza de la Constitution downtown or, bring a beach chair to the St. Augustine Beach Pavillion for the free concert Wednesday evenings May - September. Mission of Nombre de Dios: Walk the peaceful grounds of the ancient waterfront mission where the first Mass was offered in America’s First City over 400 years ago. You can’t miss the 208 foot stainless steel cross located on the grounds. Go for a swim somewhere along the 42 miles of beautiful beaches: Locals believe they are the best in Florida. In St. Augustine, location provides a range of incredible dining settings; a rich cultural heritage influences excellent menu selections. Dine in quaint historic buildings; savor perfection in a lavish dining room; sip sangria at a Spanish taverna; try gator tail in a marsh grass setting; a grouper dog in a fishcamp atmosphere. Watch the sunset from a river-side table, or become mesmerized by the rhythm of waves at a dune-side restaurant. For a taste of old Florida, authentic Cracker seafood is served at Barnacle Bill’s, flavored with the restaurant’s own datil pepper sauces such as “Dat’l Do It.” Try O’Steen’s, just across the Bridge of Lions, for St. Augustine style fried shrimp served with plenty of homemade side dishes. Beachcomber Restaurant, a local favorite on St. Augustine Beach, serves up a casual beachfront atmosphere along with great local recipes including, of course, St. Augustine’s famous fried shrimp. Dine on fresh Florida and Caribbean seafood at A1A Restaurant on the Bayfront or the Gypsy Cab Co, just across the Bridge of Lions. 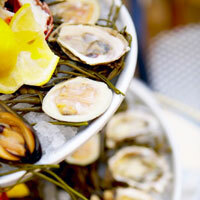 Enjoy Lowcountry cooking at the Creekside Dinery in the middle of the marshes. From Caps on the Water you’ll have breathtaking views of the sun going down over the Mantanzas River. The Columbia downtown offers paella, the signature dish from Spain, along with sangria. In the Tasting Room savor the mingling of flavors in tapas that delight the senses. Have a leisurely elegant lunch at Café Cordova or an unparalleled fine dining experience at 95 Cordova, both in the Casa Monica Hotel.